There are many advantages to having Formica flat door style bathroom vanity cabinets. There are also disadvantages as well. 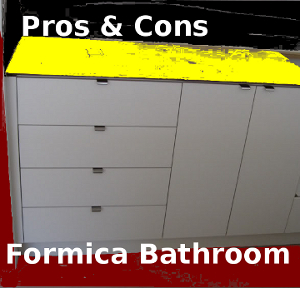 In this article, I will list some of the pros and cons of having bathroom cupboards fabricated out of plastic laminate. This style cupboard is generally made out of Melamine board for the boxes, drawer parts and sometimes the doors. Usually there’s a combination of Melamine, Masonite plywood, pine and laminate that make up the final product. Some of the cheaper lines of cupboards appear to be manufactured out of plastic laminate, but in reality the outer coating is vinyl. We see this type of construction a lot in cabinets that come ready to assemble (RTA) in a box. They are cheaply made and affordable. There are several things that have made a bad name for laminate cabinets. Although they have been extremely popular in many areas of Florida and throughout the world, there are a few disadvantages to having this style of Formica cabinets in the bathroom. The majority of these cabinets are fabricated using flakeboard because it is an economically priced material. Particleboard cabinets have gotten a bad rap through years because of periodic water damage that happens to them. The areas near the floor and inside of the sink boxes are where most of the damage occurs. If you are having your cupboards custom made insist that your manufacture makes ply-wood sink cabinets and the toe bases should be fabricated out of pine or ply-wood. This will guard tremendously against you getting water damaged cabinets if you ever have a flood or leak in the plumbing. Replacing water damaged sink cabinet bottoms can be done, but it’s best to avoid having to make this type repair. It really should not cost much extra to have the bathroom sink cabinet made out of plywood. Another one of the cons to having this style cupboard is that the plastic gets chipped. Repairing chipped Formica is not something that can always be done. If the laminate is still a stock color, oftentimes, you can have the damaged bathroom cabinet part resurfaced. It’s difficult to find discontinued Formica at times. Sometimes the manufacture will have a few sheets tucked away somewhere, but this is not likely. Most of the neutral colors such as white, antique white and almond will be around forever, but many of the Formica bathroom cabinet wood grain laminates may not be available as time goes on. This can present a problem if you decide to remodel a bathroom set of cupboards by adding more boxes or altering your existing ones. Periodically, cabinet insurance claims have to cover the cost of replacing an entire set of bathroom cabinets because the color is not being manufactured anymore. There are some pros to having Formica vanity cabinets. The two main advantages are that they are more affordable than wood cupboards and almost indestructible when built correctly. I’ve seen kid’s bathrooms totally destroyed because of the constant water droplets that get on real wood cupboard doors. Plastic laminate cabinet doors are a lot more durable at withstanding the daily water abuse that children put bathroom cabinets through. As previously mentioned, if certain areas of the cabinets are built using pine and plywood it reduces the possibility of water damage. Flat Formica doors on bathroom cabinets are so easy to clean. You can just give them a quick spray with some W index, wipe them with a clean rag and you are done. The price is certainly right in comparison to real wood cupboards. If you want real wood have them installed in the kitchen or office area and design your bathroom cabinets to be fabricated with Formica plastic laminate. The kids vanities should most certainly be fabricated using Formica. Through the years I’ve manufactured thousands of bathroom vanity cabinets out of Formica plastic laminate. We’ve used Wilson Art, Nevamar, Pionite, and Formica Brand laminates exclusively in the South Florida area where I live. There is really not an advantage or disadvantage to using any of these brands. Although a custom cabinet maker may see some differences in the materials as far one being easier to work with than the other, but the durability of the products are basically the same.